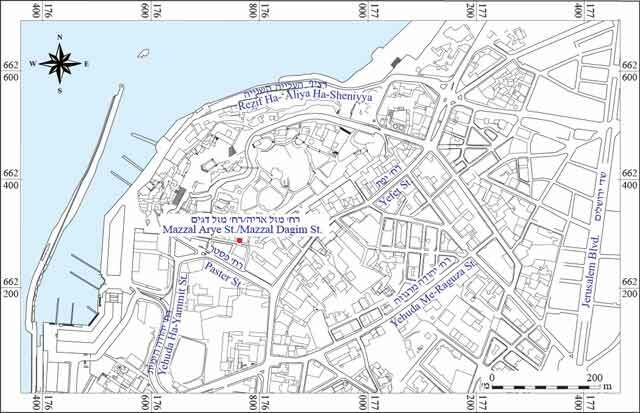 In April–August 2015, an archaeological documentation was conducted in a building located at 17–19 Mazzal Arye Street, on the corner of Mazzal Tale Street (map ref. 176711/662302; Figs. 1, 2), prior to conservation and restoration work which included the reinforcement of the structure’s foundations. The documentation, underwritten by the Israel Antiquities Authority and financed by the Berkowitz family, was directed by I. Elad, D. Golan (field photography) and A. Buchennino, with the assistance of M. Shuiskaya (pottery drawing), A. de Vincenz (pottery consultation), A. Peretz (studio photography), L. Rauchberger (clay pipes and narghile), A. Glick (cannonballs), Y. Gorin-Rosen (glass), F. Milstein (architectural consultation, surveying and drafting of an underground cavity and field photography), Y. Barshak (photo archive). Y. Arbel and A. Dayan provided consultation and documented additional remains in limited probes in March and April 2017. Additional assistance was rendered by M. Ajami, D. Barkan, A. Gorzalczany, R. Amin–Cohen, Z. Greenhut and Z. Shmul. Special thanks to the Berkowitz couple, who greatly assisted us. Mazzal Arye Street is located in the middle of Tel Yafo’s southern slope. Remains of a building and a water cistern from the Ottoman period were previously exposed on the eastern side of the street (Dayan 2011). 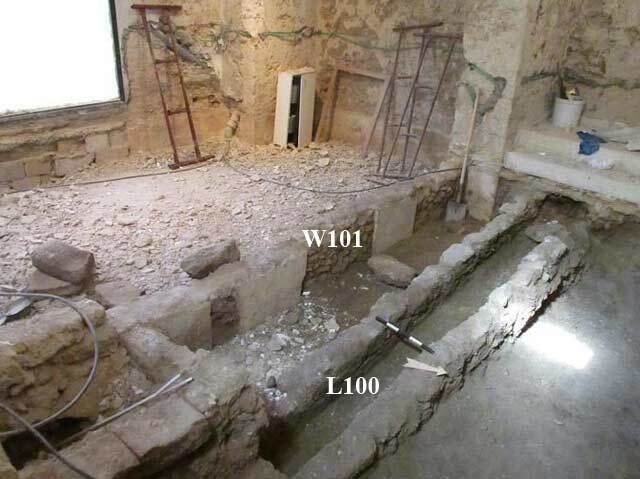 In excavations carried out on nearby Louis Pasteur Street (Barshad 2000) and Ha-Zorfim Street (Arbel 2010), remains from the Hellenistic, Byzantine, Early Islamic, Crusader, late Ottoman and the British Mandate periods were discovered. 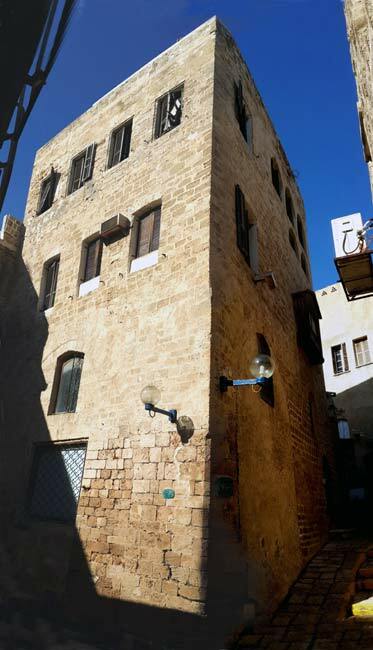 The structure at 17–19 Mazzal Arye Street is located in the architectural reserve of Old Yafo: a complex of two- and three-story buildings built of kurkar, which extends between Mazzal Arye, Mazzal Dagim and Mazzal Tale Streets. The structure is part of the dense architectural tapestry of Yafo’s Ottoman-period Kasbah. It is integrated into the urban fabric of the neighborhood as a large corner structure, whose southern, northern and eastern facades prominently flank three historic streets in Old Yafo. In its present form, the building is a landmark in the Old City of Yafo. The complex of buildings comprising the structure was erected at different times and in several construction phases. According to the field analysis, the iconographic and archival material and the well-known construction styles, it was determined that the three original parts of the complex were built in short succession of one another. The earliest component—two spaces with cross-vaults—were probably built in the eighteenth century CE, and the other two elements were built in the first half of the nineteenth century CE. The two upper stories of the eastern wing were probably added during the British Mandate, in the first quarter of the twentieth century CE. The architectural plan of the original complex, its proportions and architectural details are typical of the local (‘Eretz Israel’) construction style of the late Ottoman period, including cross-vaults, wooden-ribbed ceilings, arched openings, rectangular double-wing openings and wooden oriels (projecting bay windows). The original buildings are related to two types of dwellings during this period: a ‘courtyard house’ and a ‘bridge house’. The entrance leading into the entire complex was from today’s Mazzal Taleh Street by way of a partially covered inner courtyard, and through an inner stone staircase that led to the ‘bridge house’. An additional entrance, to the eastern part of the building, was from what is currently Mazzal Arye Street. It is unclear if both entrances were used simultaneously. Today there is only one entrance, from Mazzal Tale Street. The upper floors of the building were constructed in the manner customary during the British Mandate period, with the style, details and proportions typical of the Ottoman period. The entire building is in harmony with its surroundings, and its story adds a chapter to the history of the Old City of Yafo. 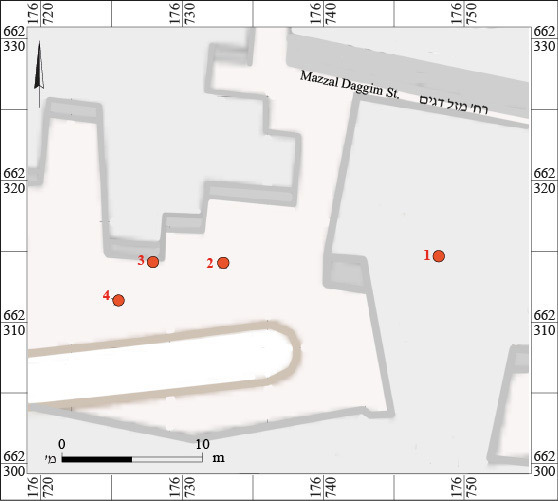 Preliminary probes were conducted in the building prior to renovating the rooms on the ground floor (B, C; Fig. 3; the floor elevations on the plan are those prior to the excavation). 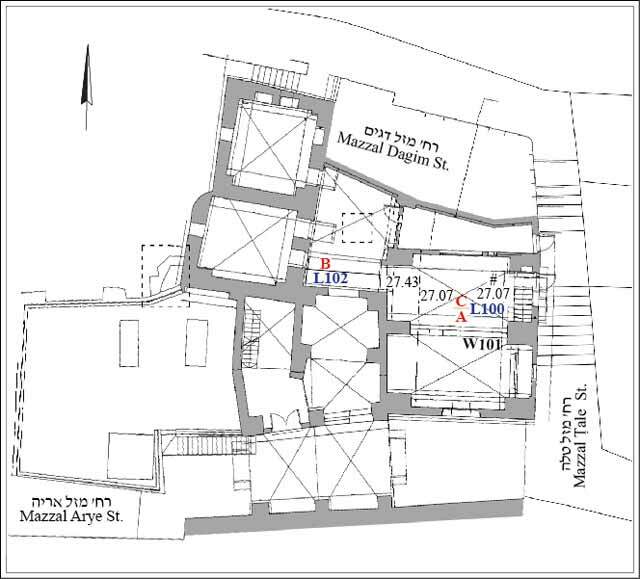 While exposing the structure’s foundations prior to reinforcing them, it became evident that under Room C was a room (A), accessed from the south, from Mazzal Arye Street, at a lower level than Mazzal Dagim Street. 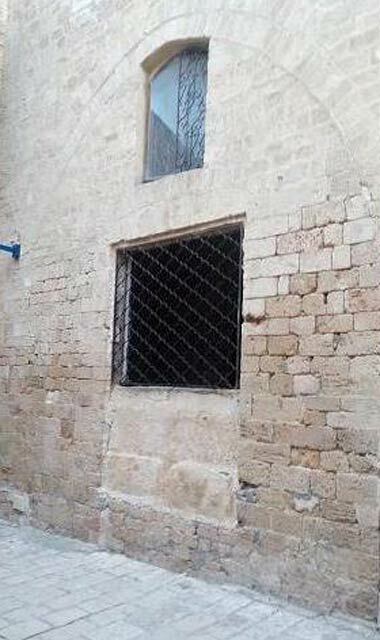 The entrance was partly blocked, leaving a window that probably served Room A after it was tuned into a basement when Room C was built above it (Fig. 4). Soil filled the room up to the level of the window (c. 2.5 m). 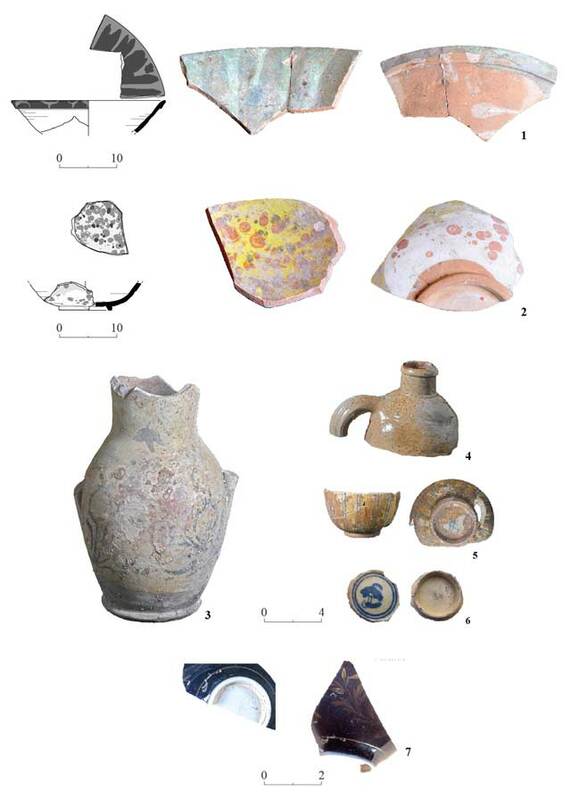 The fill contained pottery sherds from the late Ottoman period, including bowls, jars, drinking jugs and locally produced coffee cups (not drawn). Upon removing the fill, it was possible to evaluate the plan of the room. The walls and floor of the room were plastered. Wall 101 (length c. 7.6 m; Fig. 5), built of kurkar fieldstones, bisected Room A. Parts of the wall were plastered, and others bore no plaster, perhaps where an adjacent installation stood, but has since been removed. A channel (L100; length c. 8.2 m, outer width 0.8 m, inner width 0.3 m, depth 0.25 m), built of fieldstones and covered with beachrock slabs (dimensions of one of the stones: 0.1 × 0.4 × 0.6 m), was exposed c. 1 m north of W101. The channel was constructed on a foundation of hard gray mortar mixed with numerous shells. The top of the channel was located c. 0.6 m below the floor of the ground story (C). The channel descended steeply from west to east and passed through the eastern wall toward Mazzal Dagim Street (Fig. 6). 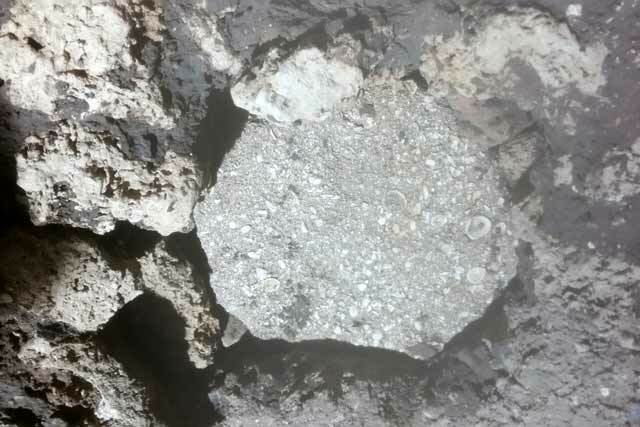 A two-mil coin dating from 1927 was found above the channel. It seems that Channel 100 postdated W101. It was not possible to determine the function of the channel. A trial trench (L102; c. 1.2 × 1.6 m; Fig. 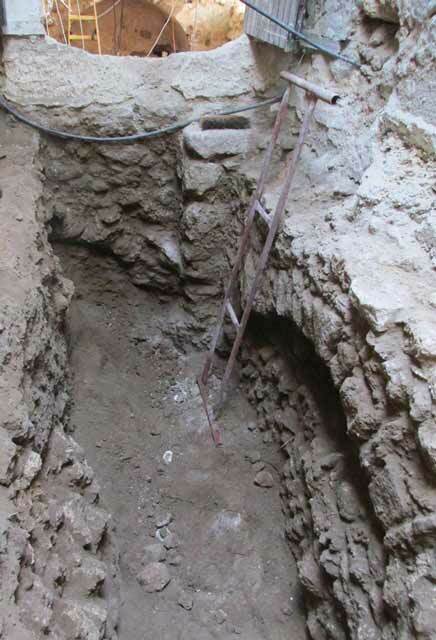 7) was excavated under the room’s floor level, where a staircase was to be built along its the southern wall. Two foundation arches were exposed: one in the southern wall (max. width 1.6 m), blocked with small fieldstones for reinforcement, and another—of which only the southern end was unearthed—in the western wall. 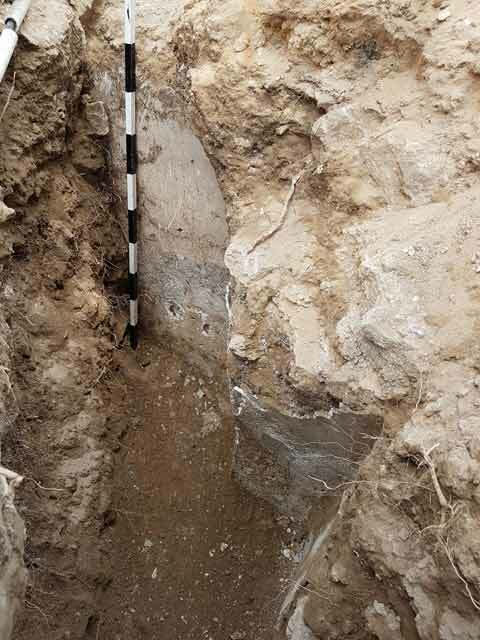 A wall foundation (width 0.9 m, height 0.9 m) built of fieldstones was exposed in the northern section of the excavation. A cluster of iron cannonballs (see Glick, below) was discovered in the southwestern corner of the trench. 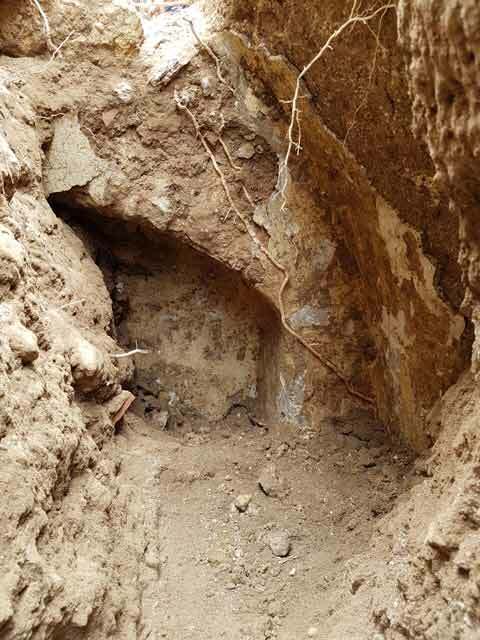 Pottery sherds that date mainly from the late Ottoman period and several sherds from the Persian, Hellenistic and Mamluk periods were found in the fill excavated in the trench (below). Pottery. The ceramic finds include amortarium from the Persian period (Fig. 8:1); a krater from the Persian or Early Hellenistic period (fourth–third centuries BCE; Fig. 8:2); an amphora from the end of the Persian period (Fig. 8:3); as well as round, black-slipped Attic bowls (Fig. 8:4–6), a red fish plate (Fig. 8:7) and a jar (Fig. 8:8) from the Hellenistic period. Mamluk-period finds included a bowl (Fig. 9:1) and a closed cooking casserole (Fig. 9:2). Most of the finds are from the late Ottoman and the early years of the British Mandate (nineteenth – early twentieth centuries CE). These include a variety of vessels, including a shallow plate (Fig. 9:3), a deep bowl (Fig. 9:4), casseroles (Fig. 9:5, 6), a stopper (Fig. 10:1), a jug (Fig. 10:2), a brik (Fig. 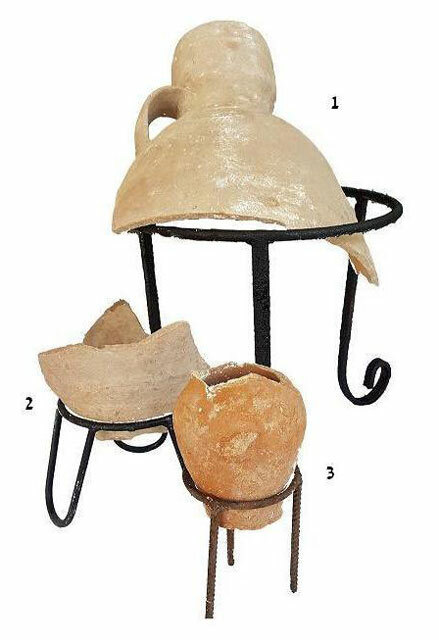 10:3) and an intact Gaza Ware oil lamp (Fig. 10:4), as well as tobacco pipes and a narghile (Fig. 11; see Rauchberger, below). 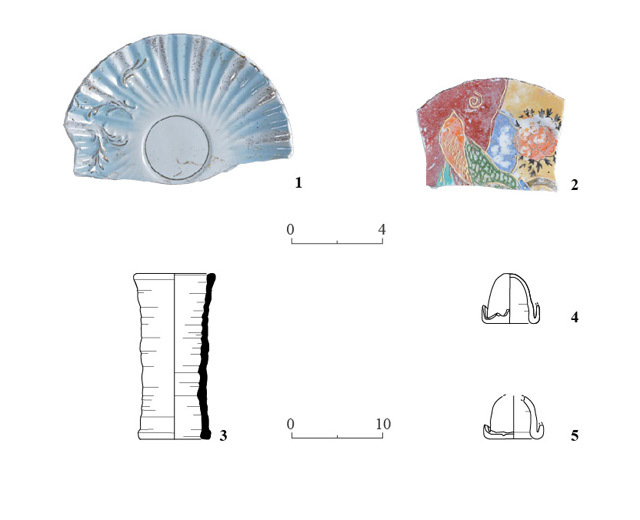 Imported vessels were also found, including two glazed bowls from Didymoteicho (Fig. 12:1, 2), one of which (No. 2) is a Marmorizzata type; a Korras (Fig. 12:3), probably from Egypt; a stoneware decanter (Fig. 12:4) imported from Germany; a coffee cup (Fig. 12:5) made by the Meissen porcelain factory in Germany, which is stamped on the bottom with a pair of crossed swords that is the symbol of the manufacturer; coffee cup (Fig. 12:6) imported from Kütahya that are stamped on their bases with the name of the pottery workshop; porcelain coffee cup (Fig. 12:7), provenance probably Germany, with cobalt blue glaze outside and gold overglaze highlights, "20X" impressed on the base; a saucer imported from Austria or Czechoslovakia (Fig. 13:1); a saucer imported from Japan (Japanese Dragon Ware; Fig. 13:2) that is stamped on the bottom with the name ‘Satsuma’; and a terra-cotta cylindrical channel pipe for a banister or a wall (length 0.18, diam. 9 cm; Fig. 13:3). Also found were two bases of large glass bottles (13:4, 5) of a type used mainly for wine that dates from the late Ottoman period. Two fragments of two tobacco pipes (Fig. 11:1, 2) and a tobacco holder (Fig. 11:3) from the Ottoman period were discovered in Room B (L102). The pipe in Fig. 11:1 is gray slipped and burnished. It has a short shank (diam. 1 cm) decorated with a line of serrated rouletting, and a wreath adorned with a serrated rouletting of diagonal lines framed within two rouletted lines. The shank ends with a short, plain termination ring. The bowl incised with vertical lines and a rouletted line that separates it from the shank. 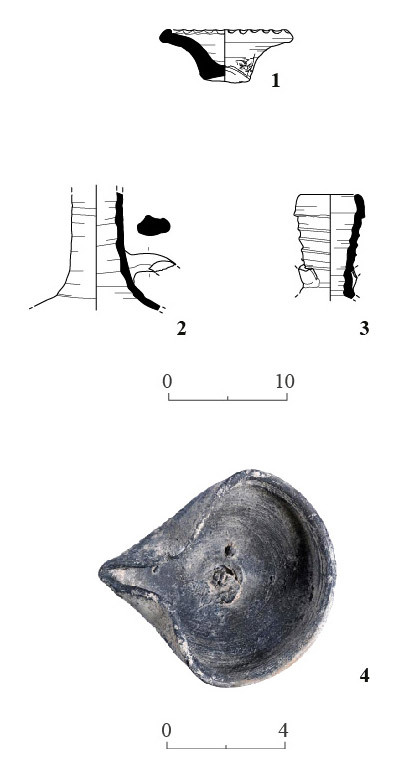 The pipe dates from the eighteenth century CE (Rauchberger 2013: Fig. 21:6). The pipe in Fig. 11:2 has a reddish brown slip and is burnished. It has a plain shank (diam. 1.5 cm), with a swollen terminus adorned with a rouletted decoration of serrated parallel lines. 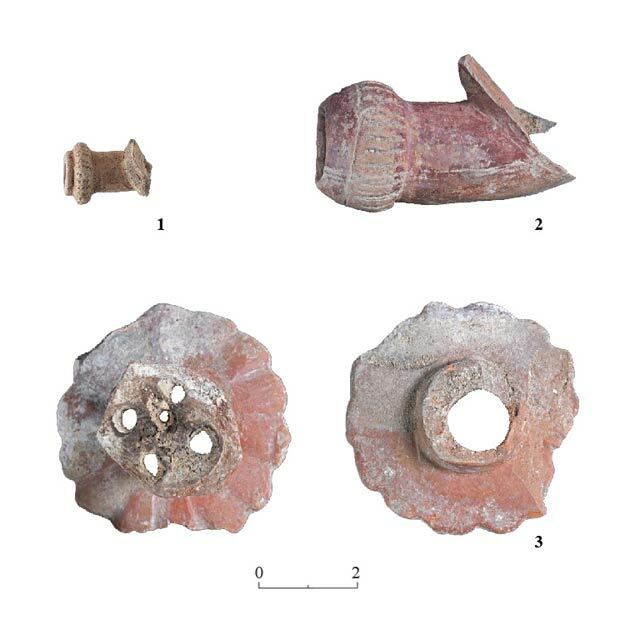 This type of pipe has a lily-shaped bowl, and it dates from the second half of the nineteenth – early twentieth centuries CE (Rauchberger 2013: Fig. 22:3). The narghile tobacco holder (Fig. 11:3) is red-slipped and burnished, and is shaped as a hollow cylinder. The head is plain and sooty, and its tapers toward the bottom; inside are four perforations surrounding a fifth one in the center. The lower part of the holder is a petal-like ‘skirt’ decorated with incised diagonal vertical lines forming oval shapes resembling leaves with rounded ends. Below the ‘skirt’ is a round tenon (inner diam. 1.3 cm). 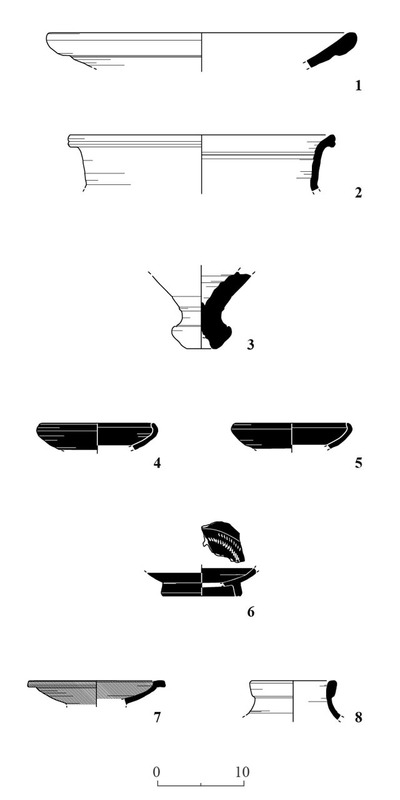 Similar tobacco holders were found in Yafo (Vincenz 2015:2, Fig. 2:4) and in Belmont (Zuba). They resemble the shape of the narghile heads manufactured in the Tophane district of Istanbul. Judging by their color and burnish, they are dated to the second half of the nineteenth century CE (Simpson 2000:168–169, Fig.13.9:198). 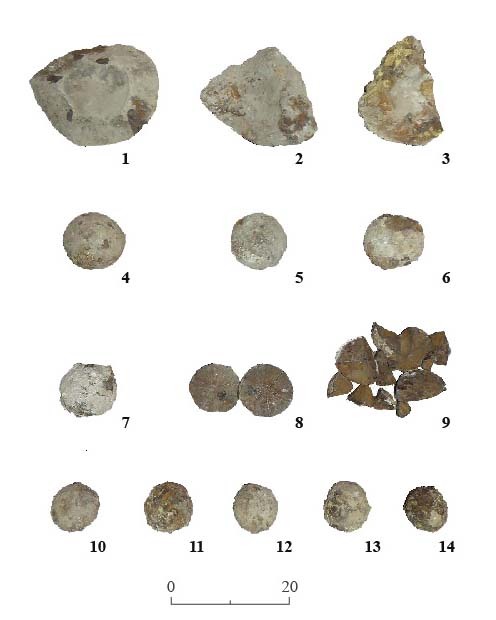 Fourteen cast-iron cannonballs were found in Room B (L102; Fig. 14; see appendix; the measurements may deviate due to the condition of the cannonballs). Due to the deteriorated condition of the cannonballs, it was impossible to identify manufacturing marks, if there were any. All the mortar or howitzer shells were detonated, as only fragments were found. Some of the cannonballs bear signs of having struck a hard target, such as a wall. Cannonball No. 9 was fractured from the impact and broke apart when picked up. The collection consists of two types of cannonballs. Three belong to a howitzer or an 8 inch mortar, all of which are known as ‘common shells’ (Nos. 1–3); two apparently belong to a French-made weapon, and the third to a British weapon. The other eleven (Nos. 4–14) are ‘round shot’ shells used in light cannons (3–6 pounders); these are almost evenly divided between French-made (heavy pound) shells and those from some other European country—possibly Britain, Austria or Italy—where light-weight shells were manufactured. The make-up of the ammunition suggests covering fire, perhaps fired at the southeastern bastion of the citadel. The absence of 12 pounders or more, capable of destroying walls, is notable, even though these are commonly found in excavations in Yafo. The shells should be dated to the eighteenth – early nineteenth centuries CE. This discovery apparently originated in a single episode of firing toward the south-eastern bastion and adjacent buildings. Heavy mortars and cannons with British, French and probably Ottoman characteristics participated in it. The blend of British, French and possibly Ottoman guns is typical of the Turkish army. The exposed assemblage may therefore be related to the conquest of Jaffa in 1776. Furthermore, it is known that after the relatively easy breaching of the wall, the Mamluks passed through it and were trapped by firing from the houses. Fighting there lasted six weeks (Tolkowsky 1924:144–146). There is no doubt that the Mamluk gunners aided their comrades by shooting at the houses behind the wall, and this house was one of them (for a detailed discussion see Glick 2017). 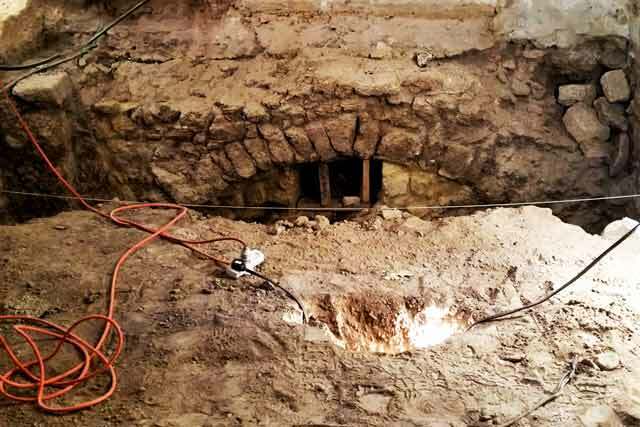 In March 2017, an installation discovered in a sealed layer beneath the floor of the existing building was documented (Figs. 15:1; 16); it probably dated from the late nineteenth or early twentieth century CE. The installation had a narrow, almost square, opening built of dressed kurkar stones and blocked with a large beachrock stone (Fig. 17). The opening led to a bell-shaped pit (Fig. 18) constructed of fieldstones or roughly dressed stones of kurkar and beachrock. The walls of the pit were coated with coarse gray plaster that was partly preserved. An accumulation of soil filled the pit. The pit was not excavated, but ceramic finds from both in between the stones and the accumulated soil were collected from inside. The earliest of these may date to the Hellenistic period and the latest are from the end of the Ottoman period (not drawn). A fragment of a Byzantine roof tile seems to have been set among the stones. The pottery sherds were insufficient for determining the date of the pit with any precision. The location of the pit inside the room and the plaster coating its walls preclude the possibility of it having been used as a cesspit. The water supply for this part of Ottoman Yafo was based on wells—hundreds of which are mentioned in writings and dozens are still known today—and not on water cisterns. Furthermore, its construction style and materials, as well as its narrow opening, do not fit those of a well. 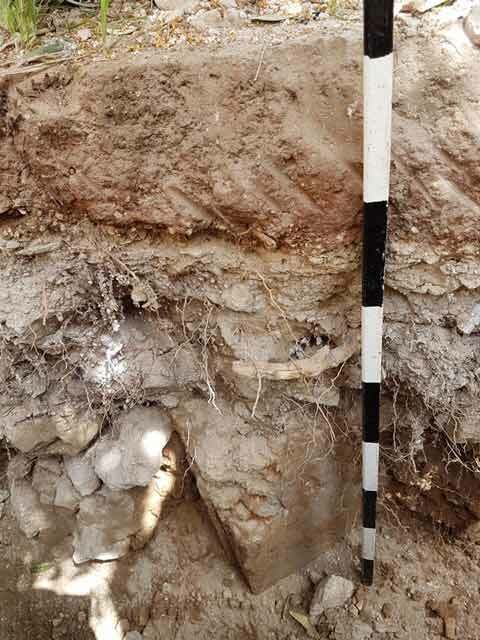 The plaster did not appear to have hydraulic characteristics, and therefore the pit was probably a silo of sorts, used for storing food or raw materials; thus, the plaster served to prevent contamination and to stabilize the walls. The stratigraphic relation between the pit and the structure is unclear. If the pit predated the building, it was accidentally damaged by the foundations of the later structure and buried beneath the floors without the builders being aware of its existence. Had they known about it, they probably would have sealed the pit completely in order to stabilize the ground and floors. A second, more plausible possibility, is that the pit was part of the original structure and related to its floor, which eventually did not survive. This suggestion is reinforced by the location of the pit exactly in the center of the room, equidistant from each of its four walls; the Ottoman pottery sherds found in the soil between the stones of the wall, beneath the plaster; and the pit's plan which is similar to other pits of this period in Yafo. The pit went out of use when renovations were carried out in the building in the later phases of the Ottoman period, and it was blocked by new floors attributed to these phases. In April 2017, a trench was dug for installing a drainage pipe outside the building. A massive plaster floor (thickness c. 0.1 m) was exposed c. 0.3 m below surface. One part of the floor abutted a wall built of coarsely dressed kurkar stones. Beneath the floor was a fill of soil, several kurkar stones and pottery sherds from the late Ottoman period, including jars (Fig. 19:1, 2) and a juglet (Fig. 19:3). Architectural remains (Fig. 15:2–4) built of coarsely dressed kurkar stones and plastered were identified in three places in the fill: a vault (width 0.7 m, height 0.4 m, excavated width 0.7 m, exposed depth 1 m; Fig. 20), a pillar of a vault in the corner of a building and a wall (general dimensions of the exposed remains 1 × 1 × 1 m; Fig. 21), and a corner of a building (general dimensions of the remains identified in the section 0.2 × 0.4 m; depth of excavation 0.8 m; Fig. 22). 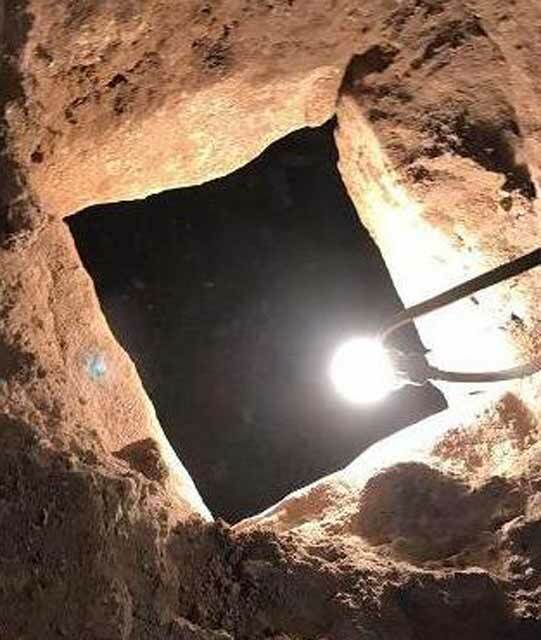 The picture arising from the probes inside the structure and outside it reveal a picture similar to that revealed in the abovementioned nearby excavations. Nevertheless, it adds another tier to our understanding of the history of Old Yafo and the changes that transpired in the buildings during the late Ottoman period. The building is of architectural and historical value, as it is part of the southeastern bloc of the Old City, much of which was destroyed during Operation Anchor conducted by the British in 1936 and later, in 1949–1950. The building’s construction and architectural style are typical of the neighborhood. Despite the numerous additions to the building over the years, it blends well into its surroundings. The finds—the pottery, glass vessels and cannon balls—reflect the extensive commercial ties between Yafo and the Ottoman Empire and Europe. The proximity to the tell explains the presence of pottery from the Persian and Hellenistic periods. Barshad D. 2000. Yafo. HA-ESI 111:101*. Dayan A. 2011. Yafo. Mazzal Arye Street. HA-ESI 123. Rauchberger L. 2013. Clay tobacco Pipes. In E. Haddad 2013. Yafo, Yehuda Ha-Yammit Street. HA-ESI 125. Simpson S.J. 2000. The Clay Pipes. In R.P. Harper and D. Pringle, eds. 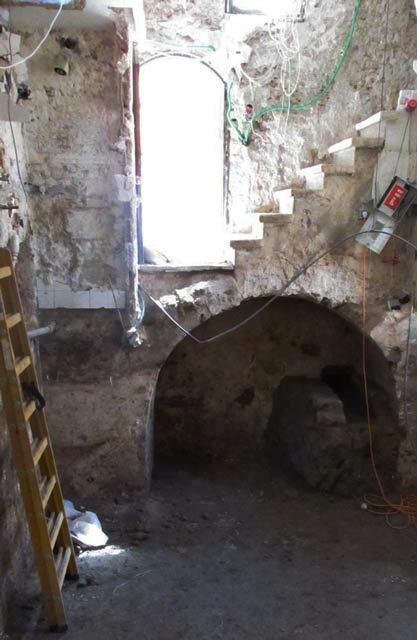 Belmont Castle: The Excavation of a Crusader Stronghold in the Kingdom of Jerusalem. Oxford. Pp. 147–171. Tolkowsky S. 1924. The Gateway of Palestine: A History of Jaffa. London. Vincenz A. de 2015. Yafo, Sha‘are Nicanor Street Appendix I: Ceramics and Porcelain Finds. In E. Jakoel and E. Haddad. Yafo, Sha‘are Nicanor Street. HA-ESI 127. 2. The building, looking northwest. 4. A blocked opening in the southern wall, looking northwest. 5. Wall 101 and Channel 100, looking southwest. 6. The outlet of the channel from the room (below the vault), looking east. 7. A trial trench in the floor of Room B, looking east. 8. Pottery from the Persian and Hellenistic periods. 9. Pottery from the Mamluk and late Ottoman periods. 10. Pottery from the late Ottoman Period (cont.). 11. Tobacco pipes and a narghile tobacco holder. 12. Imported pottery vessels from the late Ottoman period. 13. Pottery vessels from the late Ottoman period (cont.) and glass vessels. 15. Location of the plastered installation and the architectural remains outside the building. 16. The opening to the installation (center front). 17. The closing stone at the entrance to the installation. 19. Pottery from the fill outside the building. 20. A vault, looking northeast. 21. A pillar and a vault, looking northeast. 22. A corner of a building, looking east.